Good morning! It's been one of those weeks -- I'm so glad it's the weekend! 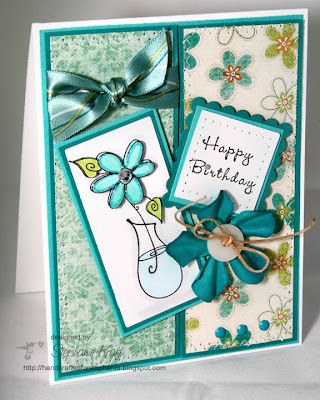 My Happy Birthday card for today uses Julee's Mojo Monday sketch #81 and the newly release set from Taylored Expressions, Fresh Flowers. I couldn't wait to ink it up. The images are so whimsical and fun! I stamped the flower twice, colored them both and cut the flower and leaves off one image and popped it onto my main image. I finished the flower off with some Star Dust stickles just around the eges of the flower and a rhinestone center. Accessories: Long Rectangle and Square Nestabilities (Spellbinders), Cuttlebug (Provo Craft), Markers (Copic), flower (Prima), button (Papertrey Ink), ribbon (Creative Imaginations, star dust stickles (Ranger), paper piercer, brads, rhinestones, twine, foam tape, thread, sewing machine.